These are made exactly half the width of a standard box so they can be used in conjunction with full width equipment. All components are fully assembled and complete. Varroa Mesh Floor including 2 way entrance block and sliding inspection tray. Packing & delivery charges for most U.K. postcodes will be £4.00 + VAT for small (less than 400mm x 50mm) post box packets or £8.00 + VAT for parcels or free for orders over £90.00. 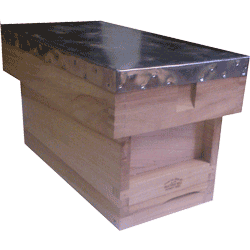 Delivery usually 3-5 working days, assembled bee hives might take a day or two longer. See Terms & Conditions of Sale & Delivery for full details.